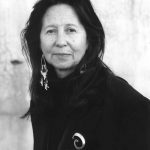 Born in a small town on the Flathead Reservation on the Confederated Salish and Kootenai Indian Reservation, Montana, Jaune Quick–to–See Smith is an internationally renowned painter, printmaker and artist. Smith has been creating complicated abstract paintings and lithographs since the 1970s, employing a wide variety of media, working in painting, printmaking and richly textured mixed media pieces. Smith is known internationally for her philosophically centered work regarding her strong traditional beliefs and political activism.